The Tristan Government announces austerity measures to stave off possible insolvency. for all Islanders to have their say. 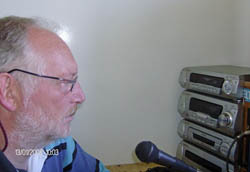 The Tristan da Cunha Administrator David Morley delivered the austerity measures heralded in his March Budget Speech (see radio broadcast below) in a communication to Islanders on 11th April 2008. A range of new taxes and charges are to be introduced with effect from 1 June 2008. These include income tax and a contribution to the island’s medical services. The community charge was increased from 1% to 3% at the beginning of the year. The Island Council voted unanimously on 7th April 2008 to introduce an incremental taxation system. This ensures that the lowest paid do not pay any tax on income. Legislation to introduce income tax to Tristan for the first time will be drawn up to be effective from 1 June 2008. Increasing medical costs (partly because of the soaring charges in South Africa and partly because of the ageing population on Tristan) mean that Government can no longer afford to provide free medical treatment to those who live on Tristan. Under the measures to be introduced, everyone, except pensioners, will be required to contribute 4% of their income towards the cost of medical treatment with effect from 1 June 2008. The FCO and Governor support the introduction of these charges as a means to help prevent the island from slipping into a position of insolvency and believe that it is appropriate to ask Tristan Islanders to make a contribution towards the cost of services they receive from the Tristan Government. "Like my Administrator I take no pleasure in the introduction of these austerity measures. But Tristan will not be able to continue to enjoy its financial independence and governmental self-determination for very much longer unless firm action is taken to redress its budget deficit and avoid insolvency. I am convinced that this is the fairest way for the community to begin to pay for the Government services it has for so long received for little or nothing. I very much hope islanders will understand the reasons behind this radical move, and accept that while unpleasant it is the right and only way forward". But the Administrator is doing his best to ensure that this isn’t all one-way traffic. Following discussions between St Helena and London, the Government of Tristan has submitted a multi-million pound bid to the European Development Fund for investment in a wide range of island infrastructure projects. Administrator David Morley made an important radio broadcast on Atlantic FM to the Tristan da Cunha community on Sunday 9th March. Effectively it was a budget speech, and sounded a warning that the Tristan Island Council needed to make some difficult decisions to limit spending and emphasis ed the importance of maximising income as for many years expenditure had exceeded income and reserves were at a dangerously low level. Read the whole broadcast word for word on the separate Budget Broadcast 2008 page. Ever since I arrived here, I’ve been warning the community about the state of the island’s economy. I’ve been saying that unless we make some significant changes to the way we operate, the island risks going bankrupt within a very few years. Some of you believe me, but I suspect a great many don’t. I’ve made some changes and increased some Government charges, but these go nowhere near far enough. Following the recent visit of an economic expert I can now offer a little more detail about the challenges we face, in the hope that you will all finally begin to understand that I am not crying wolf. First, here’s what the consultant has to say about what he found. Need to prepare a comprehensive Strategic Development Plan for the next 5 years and in general terms for the following 5 years. This should provide a consistent framework for development that should attract investment funds. Before I spell out what this could mean to the community, here’s some background. Reserves have declined by 72% in the last 10 years from more that £3 million in 1998 to £1.5 million in 2002 and £862,000 by 31 st December 2007 . They currently stand at little more than £600,000. At the present rate, they will be exhausted in 2010 or 2011 (i.e. in 3 or 4 years). There are two main reasons for the decline: (i) continuing deficits on the current account – ranging from £17,000 in 2001 to £164,000 in 2004 and £180,000 in 2000; and (ii) substantial capital expenditure of more than £750,000 in the three-year period from 1999 to 2001. Turning to what we might call our current account, from a modest surplus of £166,000 in 1997, the cumulative deficit has risen steadily from £600,000 in 2000 to £1.1 million in 2003, £1.3 million in 2006 and £1.5 million in 2007. That means that in 10 years we’ve spent £1.5 million more than we have earnt. Sell TDCH and purchase a cheaper property, resulting in a net addition to the reserves of approximately £74,000 (net). In addition, the new property would need to run on a commercial basis. There must also be a huge question mark over the future of the Wave Dancer. You might like to know why we’ve got ourselves into this mess. According to the consultant the reason is mainly this. From 1997 to 2007 there has been no concerted effort to address and/or reverse the Government’s declining financial performance. Indeed, there have been periods when executive decisions have been taken that have accelerated the decline; and past Administrators and Island Councils have ignored the periodic warnings of the Finance Department. That’s it in a nutshell. I’ve been very selective in drawing from Malcolm Summerfield’s report. It contained very little good news. But it did contain recommendations and ideas of what we can do to increase our income as well as cut our spending. I’m not going to go into these now. The purpose of this presentation is to try and convince everyone on Tristan that the chickens have now well and truly come home to roost. And it’s no use saying that the British Government must help. It is currently helping us in a number of ways (harbour, medical, training) and will continue to help, but only if Government gets a grip on its financial management and eliminates its budget deficit. In return for this, HMG may offer new support in areas such as education, Government planning and financial management. But it’s up to us to show that this won’t be good money after bad. And the same applies to Ovenstone. The loss of the old factory, and its replacement, as well as the measures needed to ensure that we actually have a fishing season this year, will cost it a great deal of money. Islanders have got to face the reality – we got ourselves into this mess. No one is going to get Tristan out of it except the community itself. As a first step, with effect from tomorrow, all Government expenditure will require Treasury authorisation, so Heads of Department should clear in advance with Lorraine any expenditure they plan to commit. I’ll circulate details of this shortly.